Kaitlyn grew up in the Half Moon Bay, California where she became interested in fisheries after interviewing local fishing families to create informational plaques that were installed in the harbor. Kaitlyn completed her B.S. in Fisheries with a Marine emphasis at Humboldt State University. She took a round-about way to graduate school, leading backpacking trips in Yosemite National Park and working on an ambulance in northern California before starting school at UAF. Kaitlyn’s master’s research, funded by PCCRC, examines under what theoretical scenarios salmon shark (Lamna ditropis) predation could influence the dynamics of Chinook salmon (Oncorhynchus tshawytscha) in the Arctic-Yukon-Kuskokwim region of Alaska. She is using a two stage approach, first estimating a range of potential per capita annual consumption levels for adult salmon sharks. And second, examining the response of an indicator Chinook salmon population to predation by investigating the sensitivity of the Chinook salmon to predation on different ocean age classes. 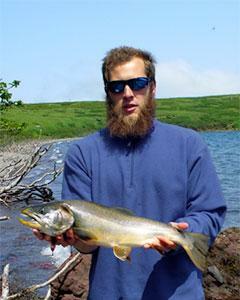 Cory received his BS in Fisheries from UAF in 2013. He began his M.S. degree in Spring of 2014. 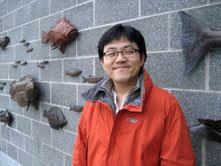 His research used a time series of freshwater and marine growth patterns for Chinook salmon to: 1. Determine the effects and relationships of freshwater and marine growth on survival to the age of reproduction for female Chinook salmon by brood year in the Taku and Unuk rivers in southeastern Alaska; 2. Better understand the environmental factors influencing and the relative importance of freshwater and marine growth in relation to recruitment success, which will allow for more accurate Chinook salmon stock assessment programs; 3. Provide baseline data relating to growth that can be used to assess the effects of industrial development and climate change on Chinook salmon growth and recruitment. I have been working in and researching commercial fisheries since 2005. In 2012, I received a Master’s degree in European Studies from Jagiellonian University in Poland, where I conducted research on stakeholder participation in Polish fisheries management. My interest in ecosystem-based management techniques brought me to the MESAS program at UAF in 2012. I live in Juneau now, and currently research management impacts in the Pacific halibut (Hippoglossus stenolepis) fleet throughout Southeast Alaska. The objective of my project is to determine impacts of three alternatives for monitoring incidental catch in the Pacific halibut fleet in Southeast Alaska. My work combines local knowledge of fishermen with landings data and fisheries-independent data. Methods include directed interviewing, cultural consensus analysis, analysis of variance (ANOVA) and analysis of covariance (ANCOVA). I plan to incorporate interview responses into a multiple criteria decision aid using the analytic hierarchy process. This will allow me to assess impacts of monitoring alternatives on profitability for fishermen and biological sustainability for common incidental catch species. I received a master's degree in Fisheries from the University of Alaska Fairbanks in 2005. I have been studying the movement of marine species since 2002, when I began tracking Tanner and red king crabs in Glacier Bay, Alaska. During this research, I helped to develop SYNAPS, a new method for obtaining precise positions for tagged fish using acoustic telemetry. The opportunity to develop much-needed methods for quantifying large-scale movement of demersal fishes brought me back to the Fisheries program at the University of Alaska Fairbanks in 2010 to begin my Ph.D. research. The goal of my current research is to develop robust statistical methods to describe and quantify large-scale movement patterns of demersal fish species such as Pacific halibut, Pacific cod, sablefish, and skates using data gathered by electronic tags. To do this, I am working on two main research objectives. First, I am developing a new method of estimating daily latitude and longitude of fish using electronic archival tags that measure and record the earth's magnetic field. Second, I am leading an effort to develop a model that can describe the migration timing, duration, and pathways of demersal fish species by combining the estimated daily latitudes and longitudes into a plausible movement track. This model is being constructed using information from electronic tags deployed on Pacific halibut and it integrates knowledge of small-scale fish movement from an earlier portion of my dissertation. James Strong completed his M.S. 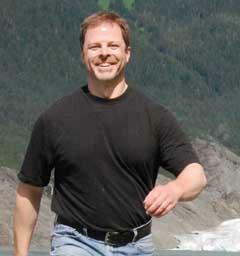 in fisheries under Dr. Keith Criddle from the University of Alaska Fairbanks in 2011. His master's thesis–Fishing for Pollock in a Sea of Change: A Historical Analysis of the Bering Sea Pollock Fishery–documents the evolution and history of the Alaska pollock fishery. The PCCRC supported the thesis's publication in monograph format. The second part of the project was the development of an econometric model of domestic and international markets for pollock roe, surimi, and fillets. The current research supported by the PCCRC involves two phases. Phase one involves development of a spatially explicit bioeconomic model of the Eastern Bering Sea (EBS) pollock fishery. The model will also include a representation of pollock catches from the Navarin basin, the competitive role of Russian pollock fillets in world markets, and dynamic factors that reflect the forcing role of environmental variation on the distribution and abundance of pollock. Stochastic simulations based on model estimates will be used to identify how changes in Russian pollock production will affect demand for Alaskan EEZ pollock and identify optimal cooperative and non-cooperative harvest management strategies from the perspective of U.S. and Russian pollock fisheries under variations in the abundance of eastern Bering Sea pollock, their spatial distribution, and in product prices and input costs. Phase two will examine the effects of salmon bycatch avoidance on the EBS pollock fishery. This project will investigate the effect of increased expenditures on factor costs, such as fuel and additional operating days. However, the focus of this phase of the study will be on the revenue impacts of avoiding salmon –e.g., the impact on recovery rates and quality. Harvesting suboptimal fish can lead to decreased recovery and reduced quality of pollock products–particularly with respect to roe production in the A season. The proposed study will develop multispecies biomass dynamics models that explicitly include predator-prey interactions among walleye pollock, Pacific cod, arrowtooth flounder, and other flatfish species in the eastern Bering Sea to quantify the strengths of their interactions and the effect of climate on these interactions. Hypotheses about possible historical climate effects on the strength of interactions among the study species are tested in a model selection framework by constructing several alternative models, which represent different hypotheses. Based on those results, possible future effects of climate change on these interactions will be quantified. Finally, effects of the current management strategies on future biomass trends of the study species, as affected by predator-prey interactions, will be forecasted under multiple climate scenarios. Currently: Data & Evaluation Supervisor Douglas Island Pink and Chum Hatchery. I completed my bachelor of science degree in marine vertebrate biology in 2006, through the University of Long Island at Southampton. I began working in Alaska as a groundfish observer in 2007 and eventually moved to Juneau where I began the SELMR Program at UAF in 2010. For my thesis research, I am looking at potential effects of organochlorine contaminants (PCBs & DDTs) on the endangered western stock of Steller sea lions (Eumetopias jubatus). There is currently no clear indication of what is causing the stock's poor recovery. Contaminants may reduce the reproductive success of females and cause animals to be more susceptible to disease thereby reducing their survivability. A series of multi‑state mark‑recapture models are being developed to estimate survival, re‑sight, and movement rates within the Russian study region. The reproductive rates of females are being analyzed from a suite of rookeries and age classes to determine any correlation between contaminants and a female’s ability to successfully reproduce. Understanding these relationships will support better management strategies and mitigation of anthropogenic influences in Steller sea lion habitat. Adam Zaleski's advisor was Shannon Atkinson. Adam graduated in Dec. 2013 and he is working for Douglas Island Pink & Chum Hatchery. 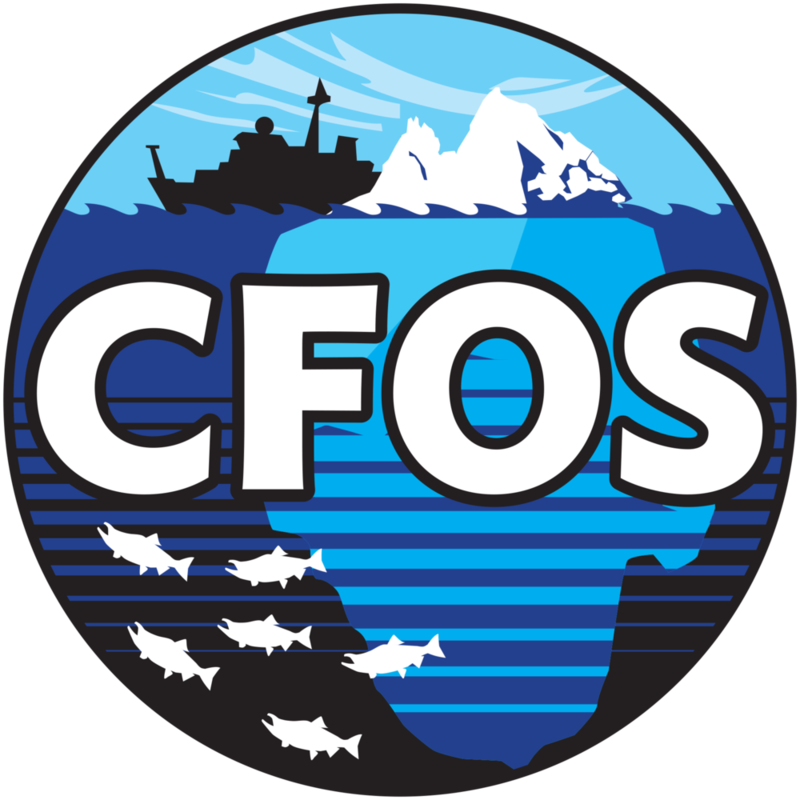 Currently: Biometrician II with Commercial Fisheries Div, ADF&G. Sara Miller recently graduated from the University of Alaska Fairbanks in 2007 with a Masters degree in fisheries. Her thesis title was "Estimating Movement with a Spatially-Explicit Stock Assessment Model of Eastern Bering Sea Walleye Pollock, Theragra chalcogramma." She is currently working towards her Ph.D. in fisheries testing the optimal stability hypothesis (Gargett 1997) using juvenile hatchery pink salmon samples from the northern Gulf of Alaska (GOA). In her optimal stability window hypothesis, Gargett (1997) argued that atmospheric circulation fluctuations between strong and weak phases of the Aleutian low pressure system produce in-phase changes in regional, coastal water column stability that affect production of phytoplankton and zooplankton. In northern regions, as the GOA, macronutrients are not limited but primary production is light-limited during winter and early spring due to both a deeper mixed layer and less sunlight. During the spring, there is a great burst of primary production that is initialized by the shallowing of the mixed layer when phytoplankton cells are now inhabiting the light zone. Therefore, the GOA is at lower end of the optimal stability window and salmon survival is likely to be favored if water column stabilities increase everywhere. Although Sara grew up in eastern Wisconsin on Lake Michigan and earned an undergraduate degree at the University of Colorado Boulder in Environmental Studies, she would spend her college summers in Bristol Bay Alaska. She worked both as a quality control and roe specialist at a salmon processing plant. The Bristol Bay region has the largest returns and commercial harvest of sockeye salmon in the world! This spawned her interest in fisheries management and biological aspects of fish. After college, she worked as a Student Conservation Association intern at the Bureau of Land Management in Eugene Oregon and collected information on riverine fish habitat and salmonid presence. Advisor: Terrance J. Quinn II. Currently: Biometrician III with Commercial Division, Alaska Dept. of Fish & Gamewith Commercial Fisheries Div, ADF&G. Fisheries management is dependent on models and methods that encompass major system dynamics as well as being robust to uncertainty from sampling, observation, and process. The ability to model distinct processes such as predation is fundamental to improving the accuracy of traditional single-species fisheries models and reducing their statistical uncertainties. Increasing accuracy and quantifying uncertainty, in turn, allow for the reduction of the economic and ecological risks inherent in determining fisheries management strategies. For his M.S. degree, Kray constructed an age-structured multispecies model under a framework developed by Dr. Terrance J. Quinn II, University of Alaska Fairbanks, and Dr. Jeremy Collie, University of Rhode Island. Termed "multispecies age-structured assessment" (MSASA), it estimates predation mortality as a flexible function of predator and prey abundances fitted to stomach-content data. Earlier multispecies models that include predation, such as multispecies virtual population assessment (MSVPA), use stomach-content data directly in predation calculations, and thereby incorporate observation and measurement error into their estimates. MSASA is thus able to accommodate statistical error in a way that MSVPA cannot. MSASA was applied to the Gulf of Alaska (GOA), modeling the population dynamics of three species with close predator-prey interactions: walleye pollock (Theragra chalcogramma), arrowtooth flounder (Atheresthes stomias), and Pacific cod (Gadus macrocephalus). Mr. Van Kirk is continuing to develop the GOA MSASA under Dr. Terrance J. Quinn II for his PhD, with an eye to the assessment and exploration of pollock population dynamics as they relate to both fishing pressure and complex multispecies interactions. Work for the first year will include the addition of major pollock predators to the model, construction of fishing scenario simulations, and an exploration of fisheries management strategies from the simulation results.